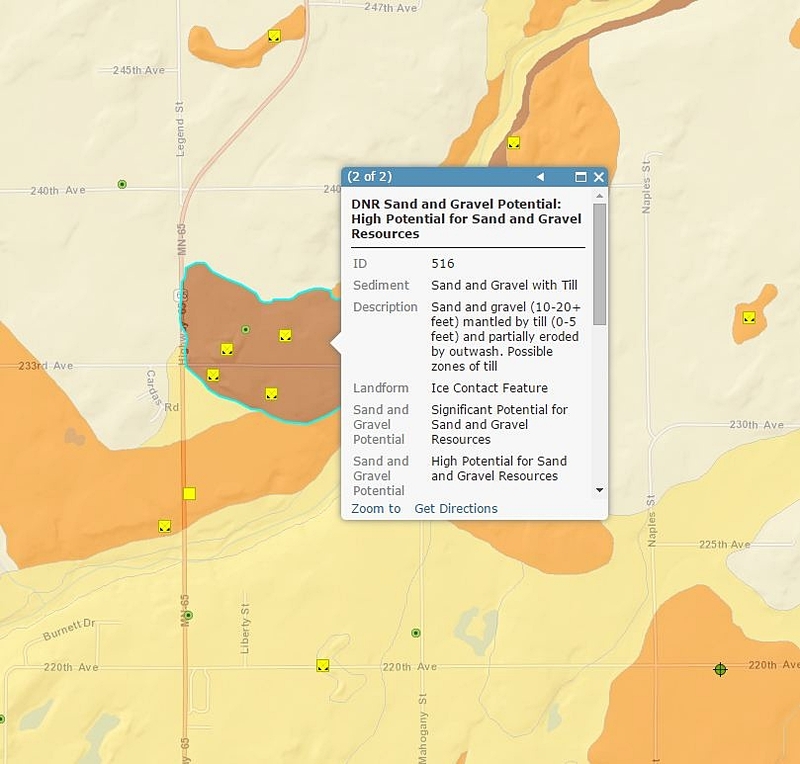 Sand and gravel potential displayed on the web map. Click on any map feature to return results in a pop-up window. New Web Map Application: A compilation of completed Aggregate Resource Mapping GIS data is now available in a new interactive web map. Please read the disclaimers below prior to going to the web map. You can search for any Minnesota county, city, or municipal township using the search bar at the top left of the application. You can turn on and off aggregate mapping data and adjust transparency in the 'Layer List' window located at the left hand side of the screen. To open the 'Layers' window click or tap the icon button that looks like three overlapping polygons. Zooming in to a county will turn the aggregate mapping layers on. Clicking or tapping on the web map will return data for visible features in a pop-up window. You can change your basemap (topographic, air photo, streets) by clicking the grey icon at the top right side of the map displayed as four adjacent white squares. Every reasonable effort has been made to ensure the accuracy of the factual data on which this map interpretation is based. However, the Department of Natural Resources does not warrant the accuracy, completeness, or any implied uses of these data. Users may wish to verify critical information; sources include both the references here and information on file in the offices of the Minnesota Department of Natural Resources. Every effort has been made to ensure the interpretation shown conforms to sound geologic and cartographic principles. No claim is made that the interpretation shown is rigorously correct, however, and it should not be used to guide engineering-scale decisions without site-specific verification. This information should not be used to establish legal title, boundaries, or locations of improvements. 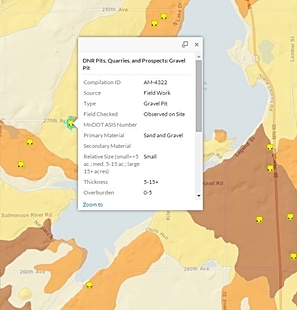 Gravel pits displayed on the web map. Click on any map feature to return results in a pop-up window. The intent of the data is to display significant deposits for the purposes of land-use decisions for aggregate resource conservation. Aggregate resources are mapped, and continue to be mapped, at a countywide scale at 1:50,000 for sand and gravel resources and at 1:100,000 for crushed stone resources. Therefore, this viewer is set to display data at a countywide level, and not at a site-specific level to view single parcels of land. This site makes use of pop-up windows. If you cannot view query results or metadata you will need to disable your browser's pop-up blocker.